TODAY on MHTV: Today we are killing two birds with one stone! If you are in a lunch rut these three hearty grain salads will be great for dinner as well as lunch the next day (the flavors only get better as it sits overnight). 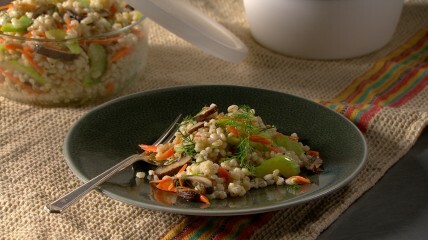 Carrots and celery add crunch to my barley, mushroom, and dill salad; my farro, feta, and mint salad is packed with protein-rich chickpeas; and my super-simple brown rice and chicken salad gets a burst of flavor from sesame seeds on top. Get the recipes from the 11:30 am ET show: Make-Ahead Strategy. Watch ”Mad Hungry with Lucinda Scala Quinn” Mondays at 11:00 a.m. ET/10:00 a.m. CT, Tuesdays- Fridays at 10 a.m./9 a.m. CT.
After watching today’s show, I just had to make this salad. Luckily I had most of the items already. I subbed canned shrooms for the creminis (for now) and green pepper for the celery. Delish!!! I’m making this salad for out-of-town guests this weekend! Thanks, Lucinda. I am looking for the recipe that you made with edamame and corn. It looked really good and I would like to make it. This was on the Mad Hungry on 9/24/12. I cannot find the recipe for the vegetable lasagna that she made on Sept 24. it was the afternoon show. Also in that show they made a bean soup with greens and she also made a dip with marscapone cheese for fruit. @ Janet: What else was on that show so we can help track down that recipe? WOULD LIKE ALL RECEIPES FROM YOUR 9/24 MORNING TV SHOW. Can not find the recipe for the edamame and corn salad and also when I click on make ahead strategy turkey i get the packable lunches to go. Can not fine the turkey recipes. Ps absolutely love the show and have fallen in love with your two boys. No worries, I am old enough to be their Grandma!!!!! Would love to meet your husband someday. Woops, just found the make ahead strategy…..sorry just didn’t look far enough, but I still don’t see the edamame and corn salad one.